Sharpening a card scraper is different than sharpening a bench chisel or plane iron. With a scraper, you are not trying to produce a razor-sharp edge. Your goal, instead, is to roll a burr onto the edge. It’s a small-scale version of the burr you get on a cold chisel after years of pounding on it with a heavy hammer. Before you can create a nice burr on the scraper, you must be certain the edge is smooth, straight and square. If your scraper is brand new, you can probably skip this step. But, if you’ve already been working with your scraper, you should take the time to joint the edge before creating the burr. 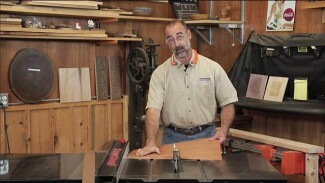 To do this, clamp the scraper in a vise and work the edge using a mill file. Be sure to keep the file perpendicular to the face of the scraper and only make outbound strokes. This will give you better control of the file. You should be able to feel when the file is in complete contact with the edge, which will tell you that the edge is nice and straight and ready for the next step. Do this to both long edges of the scraper. After you’ve smoothed and squared the edges, you have to remove the rough marks the file left behind. Use a whetstone for this job, and hold the card carefully so the edges remain perpendicular to the faces. Take a few strokes on the edges and faces to remove burrs and marks left by the file. 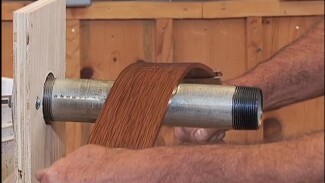 Use a burnisher, which is a piece of steel slightly harder than the scraper, to form the final burr. Mount the scraper in a vise and apply a drop of oil to the burnisher. Hold the burnisher perpendicular to the face of the scraper and push the burnisher over the edge with slight downward pressure, making 6-8 strokes. This starts “mushrooming” the edge and creates the burr. Next, hold the burnisher about five degrees off of horizontal and make 6-8 more passes on both the left and right corner. Your goal is to create two good burrs on each long edge of the scraper. To use the scraper, pull back on the corners with your fingers and push forward on the center with your thumbs to create a slight bow. The bowed section is where you’ll be cutting. Clamp your piece securely in place. Angle the scraper slightly forward (into the cut) and push it away from you. You’ll need to experiment with the angle at which you’re holding the scraper until you find the correct cutting angle. The exact cutting angle of the scraper depends on the angle at which you held the burnisher in the previous step. 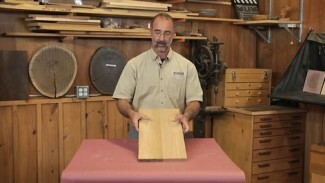 The scraper should produce shavings, not dust. If a freshly sharpened scraper only makes dust, the burr isn’t large enough. In this case, you should repeat the burnishing steps. After use, your scraper will become dull and will no longer produce paper-thin shavings. You can skip the file and whetstone steps for 3-4 sharpenings, but after that, you’ll need to re-joint the edge and start from scratch.